If you are like me, you wish that you would lead a staff meeting in which staff walked away energized. Most staff meetings are just the opposite… people checking their phones, no one comes prepared, nothing is accomplished, and then you schedule the next meeting. 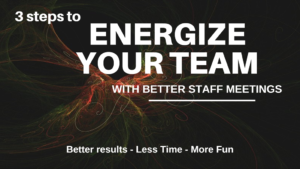 That is why I created this free toolkit to get you started on improving your staff meetings. Using this toolkit, it will take you less than 15 minutes of prep time and in the long run it will save you time and get you and your team better results.